The latest driver for your 3dfx Voodoo cards is here: are you ready to try it? The new SFFT 1.9 driver is based on the SFFT Unified Architecture; so it supports all Voodoo3 family, including Voodoo3 2000, Voodoo3 3000 and Voodoo3 3500 cards, as well as all 3dfx VSA-100 based products and so Voodoo4 4500, Voodoo5 5500 and Voodoo5 6000 cards. SFFT 1.9 driver requires a 3dfx video card working as the primary display adapter or as the secondary device used to extend the desktop as well; this release supports Microsoft Operative Systems Windows 2000 (32-bit), Windows XP (32-bit and 64-bit), Windows Vista (32-bit and 64-bit) and Windows 7 (32-bit and 64-bit). 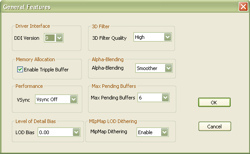 You can manage the driver's configuration and gain access to main settings by its native control panel SFFT Tools. This one is available in two packages for both 32-bit and 64-bit hardware and software configurations. Use it to improve the hardware performances or the graphics quality or both. If you have compatibility issues using this driver with very old games, you can grab the Set3Tile and Set4Tile Utilities. Those small applications change the memory layout reported by the card: 3 Tile mode allows more memory for textures but disables use of a triple buffer while 4 Tile mode is the default. Some games only work in 3 Tile mode, and some only work in 4 Tile mode.